Mrs. J.D. 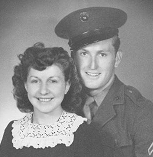 “Jo” Carter, 91 of Abilene, passed away Wednesday, December 2, 2015 at a local hospital. Visitation will be 6:00 to 8:00 P.M. Friday, December 4, at The Hamil Family Funeral Home, 6449 Buffalo Gap Road. Funeral services will be held 2:00 P.M. Saturday, December 5 at The Hamil Family Funeral Home with Rev. Doug Roysden & Bruce Campbell officiating. Burial will follow at Elmwood Memorial Park Cemetery. Jo was born in Abilene to J.A. & Mattie Forrester on February 28, 1924. She graduated from Tuscola High School in 1941. She married J.D. Carter in Abilene on August 1, 1942. Jo & J.D. owned and operated J.D. Carter Garage where she retired as office manager in 1989. She was a member of the First Christian Church. Jo was preceded in death by her husband J.D. on June 11, 2013. Her parents, J.A. & Mattie Forrester. One sister, Irene Graham & brother Eddie Forrester. Jo is survived by her daughter Vicky Lynn Stalls & husband Joe of Abilene. Grandchildren, Todd Faulks, Tiffany Lynn Hines & husband James. One great-grandson Michael Shane Grayson. Memorial may be given to the charity of choice. Online condolences may be given at www.hamilfamilyfuneralhome.com.